High on a hill on Reynolds Road in Shelburne, Massachusetts, Wheel-View Farm enjoys a stunning view. The farm house and much of the land have been in Carolyn Wheeler’s family since 1896, although she and her husband John have added to their property over the years. 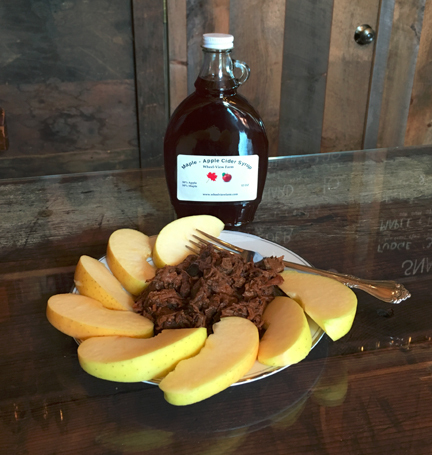 Originally a dairy farm, Wheel-View now sells mostly beef, fruit, maple products, and hard and sweet cider. When I visited last fall, the Wheelers were getting ready for Cider Days. Cider season is, of course, over—but we’re still enjoying (if that’s the word) cool weather so it FEELS like cider season. I was fortunate enough to be able to watch John Wheeler press fresh cider—and to taste his product. 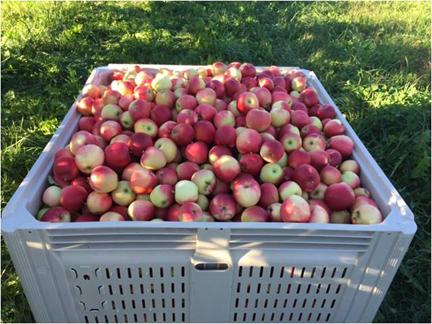 The Wheelers have a small but efficient cider-pressing system they purchased from OESCO in Conway, Massachusetts. John explained that the press was discovered in Italy, where it is used to press grapes for wine. The pressing has two stages. First, John feeds fresh, crisp apples into an electric grinder. When I visited he was using a blend of Golden Delicious, Macoun, and Liberty varieties. 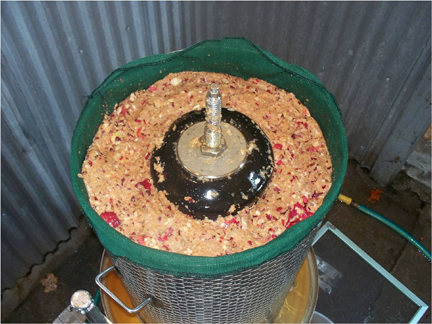 Next, the ground apples are transferred to a round press with a “bladder” in the middle. The press is powered by water from a garden hose. The water fills and expands the bladder, pushing the apple pieces out to the edges of the press. Holes in the sides allow the cider to flow out in a waterfall. When the cider has finished flowing, the dry leftover pulp becomes a treat for the Wheelers’ cattle. It is the only thing the cattle eat other than grass and hay from their own pasture. Nothing is wasted—and the cider has a deep, rich flavor. It was without doubt the best cider I have ever had. It tasted just like apples. I love apples. After the pressing, Carolyn Wheeler took me to her cider tasting room, which opened in 2016. Designed by Carolyn in an old outbuilding, the large, wood-paneled room welcomes visitors who want to buy cider or beef, as well as those who want to try a glass of hard or sweet cider on the spot along with a snack. The tasting room is also a museum of sorts. Carolyn has filled it with antiques and collectibles from the farm’s past, including many pieces of household and farm equipment. As a music lover, I enjoyed testing her player piano and listening to “The Happy Wanderer” on her family’s Victrola. The bill of sale for the Victrola hangs on the wall behind the record player. “My family never threw anything out,” Carolyn said with a smile as she pointed to the receipt. The Wheelers have welcomed a number of groups to the tasting room and the farm, from school (and college) students to the members of senior centers and granges in the area. Their visitors are encouraged to try to identify the uses of the pieces of farm equipment on display. The Wheelers are retired educators. They view Wheel-View not just as a source of food but also as a source of information about farming practices in the past and present. As they look toward the future, Carolyn told me, they hope the farm can be maintained as some kind of educational center. Meanwhile, the pair are making the most of their life as farmers. They have recently revived a traditional New England apple product John Wheeler’s grandmother used to enjoy, cider syrup (also known as boiled cider). This is cider boiled down to concentrate the flavor. 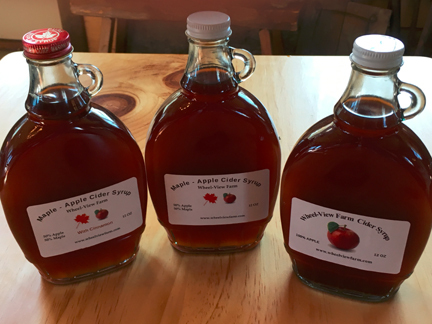 The pair sell it in three flavors: plain cider syrup, cider syrup mixed with maple, and cinnamon cider syrup. Wheel-View Farm’s cider tasting room is open most weekends, although would-be visitors are encouraged to call or check the farm’s website before venturing forth. By the way, as I mention in the second video below, I’ll be teaching a free recipe-writing workshop on Sunday, May 6, as part of ArtWeek here in Massachusetts. This week celebrates arts of all sorts and features hundreds of events, many of which are free. If you’re in the neighborhood and are thinking of writing up a recipe or two (for publication, or even just for friends a family members), I hope you’ll come. Preregistration is required, but that’s not hard to do. Here are the details. Place the roast in a slow cooker. Combine the remaining ingredients and spread them on top of the beef. Cook for 6 to 8 hours on high. There is no need to add water; the roast makes its own gravy. You may also cook it on high for 1/2 hour and then let the beef cook overnight on low. When the beef has finished cooking, remove it from the pot, cut it up if necessary (it mostly just falls apart), and return it to the sauce. We are only just now beginning to enjoy spring weather here in western Massachusetts. For the first ten days of this month, snow fell daily—not in great quantities, but enough to remind country dwellers that spring arrives when it wants to and has very little respect for paper calendars. Despite the nippy weather and the lingering snow showers, it’s hard not to notice that the days are getting longer and the sun is getting higher in the sky. I’m still eating a lot of soup—I love soup year round—but I’m also starting to cook lighter fare. Nothing is lighter or more seasonally appropriate than eggs. 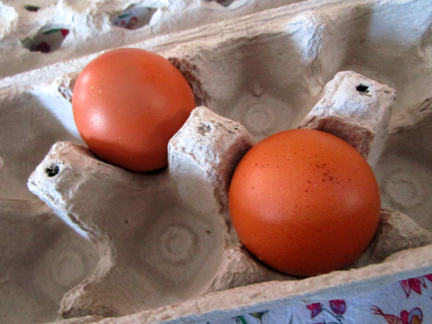 As I said when I returned to Mass Appeal this week and focused on those oval sources of protein, I’m humbled by eggs. They really are a miracle food. On a culinary level, eggs are nothing short of amazing. That something so small can fluff up into something so big always delights me, surprises me, and tickles my fancy. Eggs are also easy to work with. The two recipes I made on TV both took very little time and very little skill to put together. They were showy nevertheless. First, Lauren Zenzie joined me to make an old family favorite, an almost cheese soufflé, which my sometime neighbor Roy Lewis has dubbed “”Pseufflé.” I have shared that recipe elsewhere on this blog, but I encourage you to watch the video anyway. 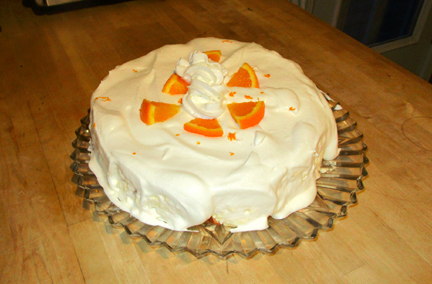 Danny New then helped me throw together a bright, tasty orange angel pudding. Everyone seemed to enjoy eating both dishes. It was great being back with my friends. Snow or no snow, they made me feel that spring had arrived! By the way, the eggs I used this week came from the wonderful agriculture program at my local elementary school, Hawlemont School in Charlemont, Massachusetts. Whisk together the egg yolks, 3/4 cup of the sugar, the orange juice, the zest and 1 pinch of salt. Cook over a double boiler until the mixture thickens and coats a spoon. (This took me about 10 minutes.) Remove the mixture from the heat. Dissolve the gelatin in about 1/3 cup of cold water, and stir it into the egg-yolk mixture. Beat together the egg whites, the remaining sugar, and the remaining salt until stiff. Fold the whites gently into the custard mixture. Line a springform pan with waxed paper or parchment, and alternate the custard and the cake in it beginning and ending with custard. Chill the mixture for 24 hours. Unmold the pudding, and cover it with whipped cream. If you want to make your life easier, forget the springform, and do the layering in a trifle bowl; you may serve the pudding right out of that. Serves 8 to 10.